The yarn we use in this pattern, Wanderlust, is our bulkiest yarn yet - lofty, luscious and all sorts of yummy in a range of gorgeous handcarded and handspun colors. Each color combination has its own unique set of fiber colors. 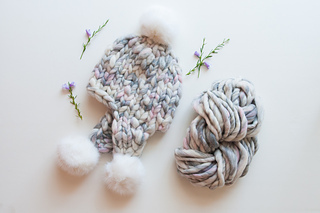 You’ll just need one skein per hat! 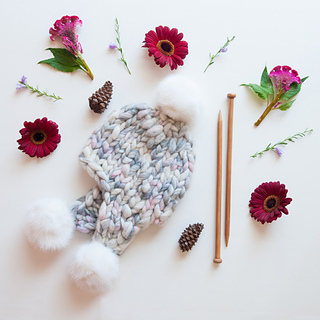 Materials: 1 skein Wanderlust or Flower Child yarn and 3 faux fur pom poms - we like these ones and used them in the sample shown here.